Pinnacle takes great pride in its magnificent fleet of yachts, all of which are maintained to the highest standard by our professional staff that follow a rigorous service protocol. This protocol begins as new vessels enters the fleet and continues across their entire tenure in the program. It is executed by skilled maintenance technicians armed with the knowledge, tools, parts and technology necessary to keep all vessels running well, operating safely and looking great for its Members. 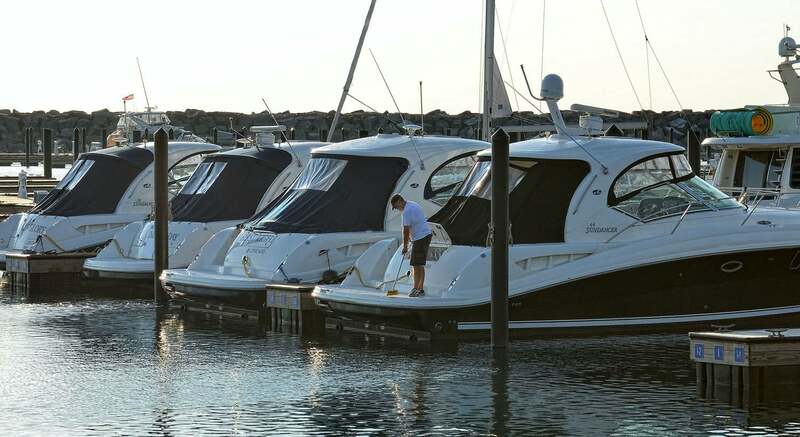 By design all vessels in the Pinnacle fleet are Sailboats by Jeanneau or Powerboats by Sea Ray. This strategy of limiting the fleet to these two major manufactures has allowed Pinnacle to build a deep acumen regarding how these yachts are engineered and maintained. With this extensive insight, Pinnacle enhances each boat when it enters the fleet and periodically thereafter to make them more robust. For Members this translates into consistent vessel availability. Pinnacle Members are sometimes surprised to learn that about 300 maintenance work orders are processed on each Pinnacle vessel each and every year. This is because only a small fraction of maintenance work orders are actually initiated by our Members. The vast majority are the result of our extensive off-season and in-season preventative maintenance program performed by Pinnacle staff without Member initiation or involvement. Pinnacle`s commitment to continual preventative maintenance performed in the background translates directly into safe, hassle-free enjoyment of the yacht by our Members. For critical issues that require urgent attention, Pinnacle provides our skilled maintenance staff and other Towing and Emergency services 7 days a week. Limiting the number of yacht manufacturers and models allows Pinnacle to maintain a comprehensive inventory of spare parts. Our inventory investment is very substantial. It is based on our extensive real-world reliability and parts availability experience for specific yachts in the Pinnacle Fleet.